Install home fire sprinkler systems correctly and save lives. 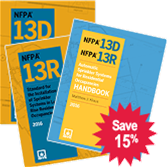 The 2016 NFPA 13D, NFPA 13R, and Handbook Set gives you complete support at a special savings. Get what you need to install residential fire sprinklers with confidence. Update to the new NFPA 13D and NFPA 13R, plus the redesigned 2016 Automatic Sprinkler Systems for Residential Occupancies Handbook -- NFPA®'s exclusive resource loaded with advice, full-color visuals, and a wealth of information about the latest sprinkler technologies and risk-reduction strategies. Help prevent fire deaths and property loss with the time- and money-saving 2016 NFPA 13D, NFPA 13R, and Handbook Set.